Instructions: Cut bacon strips in half, so there are 32 slices about 6 inches long. Cut each chicken breast in half lengthwise, then each half into quarters, to create 8 chunks. 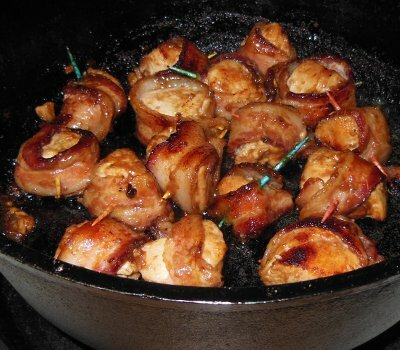 Tightly wrap one of the short bacon strips around a chicken chunk and toothpick it in place. Repeat for all the chicken chunks and lay them in dutch oven. Heat dutch oven to about 375 degrees on coals for Frying. Fry for about 15 minutes, flipping the chicken chunks over every few minutes. Pour teriyaki or bbq sauce over chicken, and stir. Cover with dutch oven lid, move some heat to the lid, and heat to about 350 degrees for Baking.